I saw this one at the very last minute and as a total lark because the time was convenient (! ), the girls were not with me, and I figured, "Better now than never; they wouldn't want to see it anyway." Shockingly, I actually kinda loved it! It's not faring too well among critics, but I thought it was original, clever, and twisty. 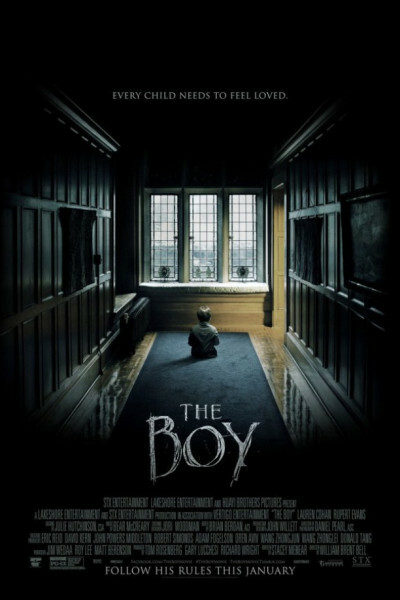 Filmed in British Columbia masquerading as England, the scenery is lush, the castle is gorgeous, and the boy is playful and creepy. It's also visually beautiful, in a very X-Files sorta way, blue-gray and damp. Having only caught a couple episodes of The Walking Dead's first season (and abandoning it), relative newcomer Lauren Cohan was a surprise to me, and delightful. I look forward to seeing her again in Batman vs. Superman: Dawn of Justice as Martha Wayne. Lots of folks are giving The Boy C's and D's, but I'd give it a strong B or, at worst, a B-. It's not The Witch, which opens wide February 19th and will scramble your mind like eggs, but it's a serviceable meantime romp and, if you're into horror, looking for some, and thinking none is out there right now, don't believe the haters. The Boy is worth seeing.